Senator Bernie Sanders (I-VT) has been a passionate champion of universal healthcare for decades. As the issue takes center-stage in the 2020 Democratic primary, he’s reintroduced his groundbreaking Medicare-for-All bill in the Senate. The bill would eliminate the wasteful private insurance industry and guarantee healthcare to every American by raising taxes on the wealthy. Here’s how you can help build grassroots support for the policy now. 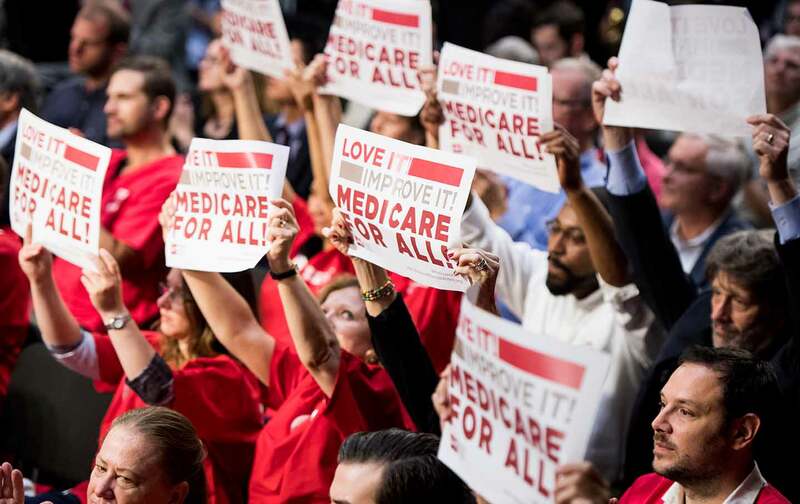 This week’s Take Action Now shows you how to organize for Medicare for All from home and in the streets. Last time it was introduced in 2017, Sanders’s Medicare-for-All bill had nearly a dozen Democratic cosponsors in the Senate. We can make universal healthcare a priority in the 2020 primary if we build support for the bill now; call your senators and urge them to sign on to the bill as well. No matter who wins the Democratic nomination, it’s essential that we push voters coast to coast to show up to the polls and vote out President Trump and the Republican down-ticket. SwingLeft is enlisting volunteers to write letters to voters across the country through its Vote Forward program; it’s a great way to boost turnout many months before Election Day. We’ve given you ways to organize for universal healthcare on the ground before, but now’s the time to find a phone bank or door-to-door canvass near you. National Nurses United can help you locate upcoming events in your area, and you can also contact them to plan a canvass of your own.